Science fiction is no match for industrial non-stop China. Electric bikes zip across the cities of Shanghai and Beijing, and soundtrack the neon nights with their passing whirr. Here, some kind of two-wheeled revolution has taken place which are we completely unaware of in the West. It’s Blade Runner meets Total Recall in a future which has already come to pass. The very existence of our elegant night train from Shanghai to Beijing is itself a reflection of the causes of air pollution and the associated health problems in China. So are the gigantic skyscrapers which hang over Shanghai, the cars and motorbikes which fill its streets, and the factories that crowd the landscape in and around the city. This is uncapped capitalism, with government officials that often appear reluctant to implement major environmental regulations to safeguard its citizens. According to a 2017 Chinese media report, an assessment of companies in the Beijing area established that more than 70% are violating air pollution regulations. This is grim news. But what about the environmental movement? Well, it’s growing. Grass-roots environmental activism has gained ground in China, but has often been confronted with suppression, as police forces have been known to break up protests and detain activists and journalists who speak out against the powers that be. Without these forces at work the people have no voice and industrial actors can continue polluting the lungs of their fellow citizens without major repercussions. That being said, over the last few years the Chinese government has announced several initiatives to tackle air pollution and other environmental issues in the near future. This includes implementing a carbon trading scheme, establishing a ban on petrol and diesel cars, capping coal-fired power use, to name a few projects. Recently, China has laid out a new Air Pollution Action Plan, requiring many key regions to meet strict air quality targets by 2020. These projects have potential, as past policies have experienced degrees of success. For example, China’s 2013 Air Pollution Action Plan helped lower the annual average PM2.5 level in Beijing to 58µg/m³ by 2017, a 35% drop in air pollution. However, at the moment, it remains unclear what the impact of new these plans will be, or if they will be enough to address human health risks. In the case of Beijing, the level of air pollution in the city is still well above the standard set by the World Health Organization, who recommends that the annual average PM2.5 level should be below 10 µg/m³. 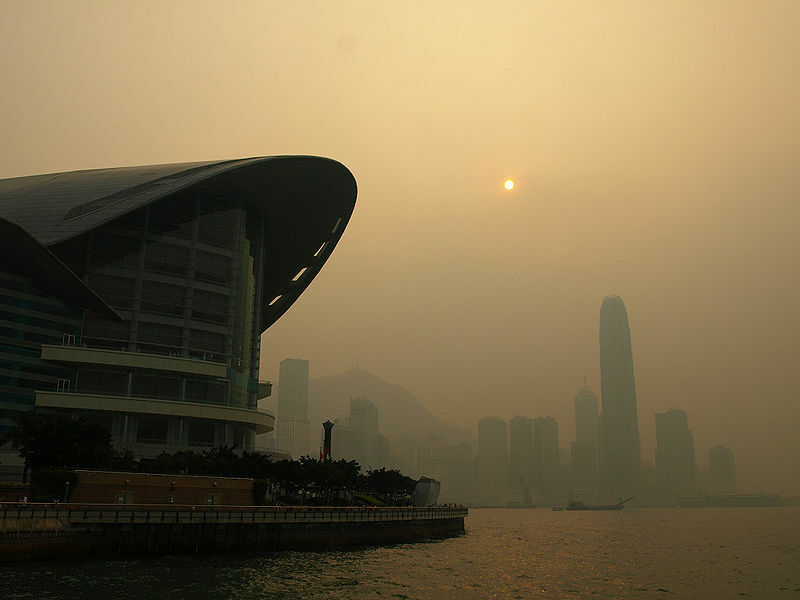 Air Pollution in Victoria Harbour in Hong Kong. (Credit: Yym1997, distributed via Wikimedia Commons). For sure, investment in renewable technologies – itself a way to create employment in research and development – will also help reduce the burning of unsustainable fossil fuels. The electric bikes which surround us as we walk the streets of Shanghai demonstrate progress. Additionally, China has become a leader in renewable energy investment, accounting for 45% of the world’s commitment to renewables in 2017. But there remain problems around emissions from the pharmaceutical and petrochemical industries, themselves major contributors to air pollution in the country. There have been steps in the right direction, and China has the potential to become a world leader in renewable tech; after all, it is likely that Earth’s next super power will be accelerated, not retarded, by a clean energy revolution. But for now, the smog clouds remain, and for me they serve to warn that governments and corporations worldwide are taking control over nature. The consequences will not be pleasant. 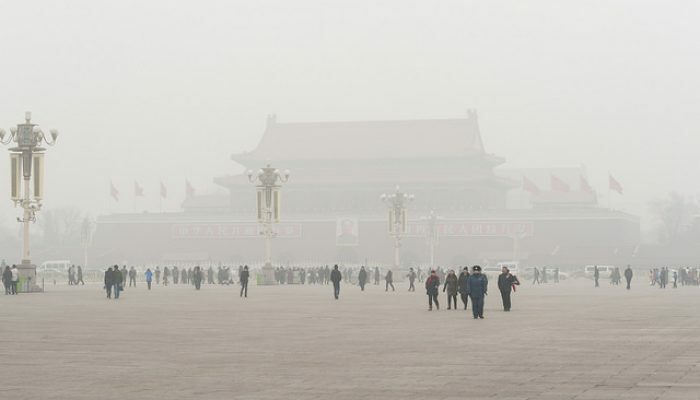 This is Part 2 of a two-part series on the impact of air pollution in China and the country’s steps taken to user a clean era for the 21st century. You can read Part 1 via Geolog. Conor Purcell is a science journalist with a PhD in Earth Science. He is the founding editor of www.wideorbits.com and can be found on twitter @ConorPPurcell and some of his other articles at cppurcell.tumblr.com.